I think most of you are already aware of the Real Techniques Makeup Brushes and how cute and tempting they are. Those of you, who are not aware, Real Techniques is an affordable makeup brush line owned by Samantha and Nicola Chapman.The brushes are cruelty-free, made of synthetic Taklon and not tested on animals. Each brush head is hand-cut and the brush collection works with a wide variety of makeup products from powders to creams and liquids. I wanted to buy some of their brushes since a long time and finally, few months back, I gave in to temptation and bought few of them. But I was not very happy to receive them. Keep reading to know what I got and my Sweet-Bitter experience. So, after going through iHerb and Real Techniques's website a thousand time, I made up my mind to shop from iHerbs. It was really difficult for me to decide what to buy and here's what I picked finally. This is how the brushes and makeup sponge looks like. Will share more pics later. Now, let's come to the bitter part. My total came to ₹3324.81 and I think I got a 10% discount on my first order. Plus ₹543.34 was the shipping cost. So, my total came to ₹3,525.57. While checking out, you get an option to choose your shipping method (UPS and DHL). I choose DHL because it was cheaper but I think its no longer available. I think the package reached me pretty soon and I was really excited when the courier guy called me up. But the excitement soon turned into disappointment when I received a Custom Slip with my package. I had to pay 2502.18 frigging rupees as custom duty which is almost 65% of the total amount and that was insane. So, for an order worth ₹2982, I had to pay ₹543 as shipping charges and ₹2502 as custom duty. 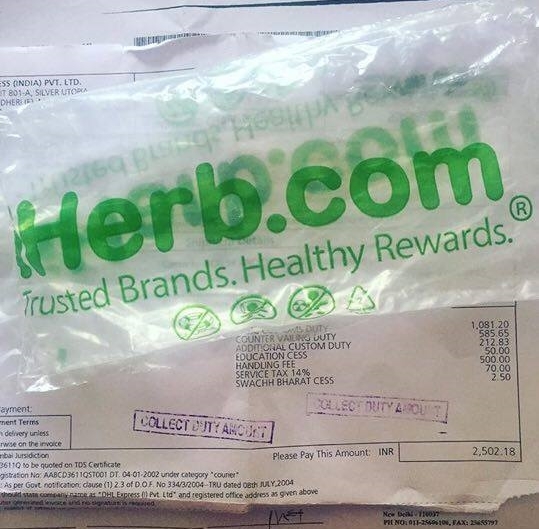 All in all, it was a bad experience and I will never shop from iHerb again. I am in love with the brushes though. p.s. Real Techniques ships to India via local carrier. All orders are delivered by mail with no tracking. The shipping cost depends on the destination and the total weight of the package which can be calculated during checkout. Any import fees applied to the package is the responsibility of the customer. The brushes are also available on Amazon.in, Nykaa, Flipkart, to name a few. Hope this post was helpful.